We are expertise in the manufacturing of a precision engineered range of Transformer Oil Filtration Plant. Available in various flow rate options, these are suitable for up-gradation purification and reclamation/regeneration of insulating oils. 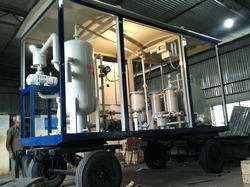 Mobile Transformer Oil Filtration Plant, during its operation of generating, transmitting and distributing power transformers give out heat which is absorbed by insulating oils. This oil has a tendency to absorb moisture from windings which leads to gradual deterioration of dielectric strength. Our filtration systems provide economical and efficient methods of purifying this lubricant. Looking for Transformer Oil Filtration Plant ?